Fiberglass-reinforced plastics: cutting hazards and other MSDS information: this article describes possible health hazards when working with fiberglass-reinforced plastic products and materials. Our page top photo illustrates a fiberglass-reinforced lightweight Bell™ Canoe in use in the Quetico wilderness. Fiberglass hazards in buildings: this article series provides information about how to identify fiberglass insulation in buildings and fiberglass hazards and fiberglass insulation contamination issues in residential and light-commercial buildings. The fiberglass research literature is replete with studies indicating that there are no health hazards associated with airborne fiberglass particles, and with other studies reaching quite the opposite conclusion. We recommend that readers examine carefully the methodology used in such studies, the expertise of the researchers, and the sources financing of such work. I'm covering a new fireplace with faux-stone decorative panels made of fibreglass reinforced plastics (polyester resin + fiberglass + marble dust) and last Tuesday a panel was cut in the home (the others were generally cut outdoors). Since then my family and I have been living with thick dust 24 hours a day. Photo at left adapted from an image of fiberglass reinforced and very realistic faux-stone panel, available from Texture Plus (www.textureplus.com) . I am pregnant and have two children aged 7 and 2 (the two-year-old boy now has cough and red eyes, and I have too in a milder way). I have tried to dust and clean the floor in the ordinary way but I'm not sure that's enough. Is this situation dangerous for my family? Even without onsite testing, I agree that in general, exposure to high levels of almost any sort of dust, especially dust containing fine particulates, would be a respiratory irritant and at very high exposures or at chronic exposures is a potential health concern. Large particles of plastic or fiberglass are typically not inhaled deeply into lungs, and as you'll read at our fiberglass hazards articles at InspectAPedia, are asserted by at least some studies as not a great hazard. But fine particulates can be more of a concern, and also fine particulates are not as easily cleaned or removed by ordinary housecleaning. If a fiberglass reinforced plastic panel was cut inside your home and appeared to produce a lot of dust, I suggest that rather than spending the $1500. U.S. or so that would be the cost of a truly competent and reliable and thorough building inspection and testing, spend your time and money and effort on a thorough, or if you prefer, professional cleaning of the home, including areas more distant from the cutting source but to which small or fine dust particles may have traveled. Just which areas need additional cleaning really depends on how far the cutting dust spread through the building - by direct air transport or potentially by movement through a warm air heat or cool air conditioning system if such were in operation and not well filtered. Certainly remote building areas closed off by doorways or other means during this problem are not as likely to have high levels of this irritating dust. This cleanup typically involves HEPA vacuuming and damp wiping of all indoor surfaces and contents sufficient to remove most of the irritating dust. If there is central air conditioning or heating, it might be appropriate to clean the ductwork (if it can be cleaned without damage) and air handler as well as of course changing the air filters. Are there health concerns from FRP dust exposure? In sum, the industry does not indicate signifiant healt concerns associated with working with FRP produts. Beyond cleaning, questions about persistent respiratory or health worries are a matter you should discuss with your physician. Inhalation: Not considered a problem under normal use. Dust generated during machining can cause short-term irritation of the mouth, nose, throat or upper respiratory tract. Eye contact: Not considered a problem under normal use. Contact with dust generated during machining can cause short-term irritation. Skin contact: Not considered a problem under normal use. Contact with dust generated during machining can cause skin irritation. Note further that depending on the fiberglass reinforced plastic product involved, there may be trace levels of formaldehyde present during machining or cutting - see the second MSDS we cite below. Do keep me posted on how things progress, as what we learn may assist other readers. 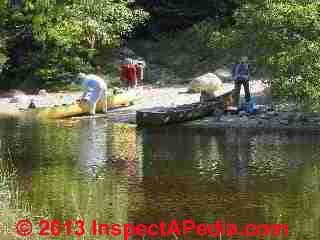 Our photo (left) illustrates two ultra-lightweight canoes in use in the Quetico wilderness. The left-most canoe is a 17-foot fiberglass-reinforced canoe while the right-most canoe is a 17-foot canoe made of resin reinforced kevlar. Both of these canoes offer very light weight and strong service, but both also need to be protected from sidewall damage by impact on sharp rocks. We carried duct tape for emergency repairs but have never needed to use it. - Ed. operations as a co-contaminant with the dust. Formaldehyde has an OSHA PEL of 0.75 ppm. decomposition or burning may irritate eyes, nose, and throat. Minimize operator exposure to dust and fumes. Skin Contact with dust may cause moderate skin irritation. Eyes Contact with dust may cause moderate eye irritation, itching and redness. There are trace quantities of formaldehyde contained in the resin matrix. Formaldehyde is a Human Carcinogen according to IARC and classified as Reasonably Anticipated To Be a Human Carcinogen by NTP. respirable fiber shaped plastic (organic) particles and nonrespirable fibrous glass dust. Prolonged inhalation of dust can produce lung disease. Continue reading at FIBERGLASS HAZARDS or select a topic from closely-related articles below, or see our complete INDEX to RELATED ARTICLES below. FIBERGLASS REINFORCED PLASTICS at InspectApedia.com - online encyclopedia of building & environmental inspection, testing, diagnosis, repair, & problem prevention advice.